Hey, so remember when Showtime would only ever officially confirm Kyle MacLachlan among its Twin Peaks revival cast, despite the myriad of casting leaks over the last few months? 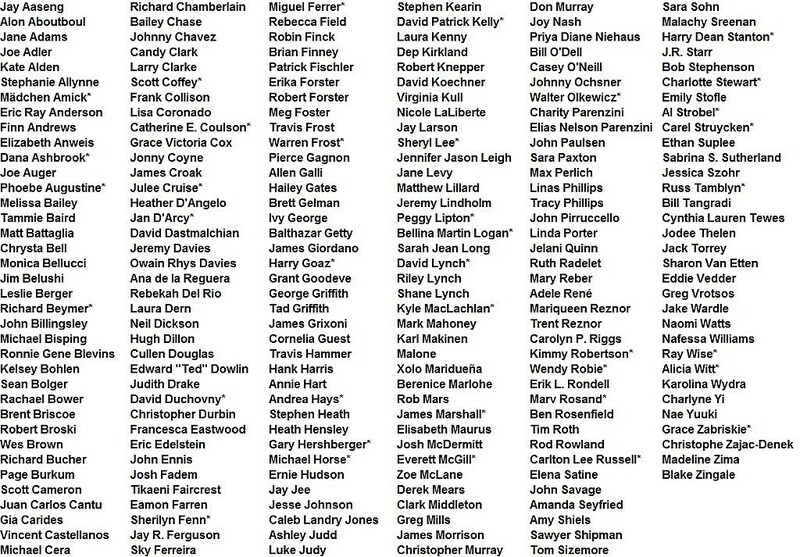 Get ready for the opposite problem, as the official 2017 Twin Peaks cast lists off a whopping 217 members, previously unannounced, new and returning alike. You could probably spend an hour sorting through all the names in Showtime’s extensive announcement and still miss a few, but suffice to say, impressive new additions include the likes of Monica Bellucci, Michael Cera, Tim Roth, Ghostbusters alum Ernie Hudson, Walking Dead star Josh McDermitt, and musicians like Trent Reznor and Eddie Vedder. It also appears that David Duchovny will reprise his famous role (as will many others), though no Lara Flynn Boyle, it seems. David Lynch and Twin Peaks co-creator Mark Frost have now completed principal photography, with Lynch confirmed to have directed all episodes of the revival series, however many that turns out to be. Twin Peaks composer Angelo Badalamenti’s return is also set, alongside stars Madchen Amick, Dana Ashbrook, Sheryl Lee, Michael Horse, Sherilyn Fenn, Miguel Ferrer, David Patrick Kelly, Richard Beymer and new additions Ashley Judd, James Belushi, Naomi Watts, Tom Sizemore, Laura Dern, Jennifer Jason Leigh, Robert Forster, Peter Sarsgaard, Robert Knepper, Amanda Seyfried and Balthazar Getty. The original Twin Peaks saw Agent Dale Cooper arriving in the titular town to investigate the murder of homecoming queen Laura Palmer, only to find the mystery ran far deeper than he could ever expect, with a touch of the supernatural. The new iteration will pick up 25 years after the Season 2 finale in 1991, which saw MacLachlan’s Agent Cooper in a Black Lodge limbo. Showtime may come forth with additional Twin Peaks details for 2017 soon, but what do we make of the massive cast?